The star man, the main actor, the leader. If he’s being billed as a ‘marquee signing’ Gary Roberts is happy to take that status on his shoulders, too. Paul Cook was charging around the Fratton Park offices like a manager on a time-lapse video. As an arrival it was one of the most confident witnessed at Pompey in years, as he spoke last week. The man Paul Cook has chased all summer wasn’t given the big press conference treatment afforded some of his predecessors down the years. But it was a performance which was the equal of that given by many stellar names unveiled at PO4 to great fanfare. Of course, the 31-year-old now has to live up to hype. Ten days ago, Roberts seemed like just another player on the hit-list. A name among many set to arrive this summer. Things seemed to have changed somewhat since. The strength of Roberts’ quiet assurance, as he spoke to The News in the bowels of Fratton Park has been a catalyst for the change. Being an affable character, he stopped short of bristling at the mention of him being handed a three-year contract – a rarity at League Two level. But, still, it was a pretty definitive riposte. ‘People say it’s a big contract at this level and me at 31 – I can’t get my head around it,’ said Roberts, in his low Scouse rasp. Then came the mention of his billing as a key man, Pompey’s Paul Merson for 2015. ‘Listen, I can’t wait to get on the pitch and produce,’ Roberts added. As Roberts was affording us his time, Paul Cook was charging around the Fratton Park offices like a manager on a time-lapse video. 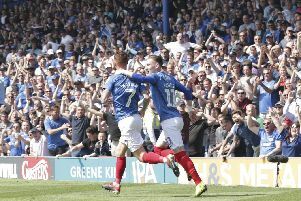 The reason for his excitement was the capture of the man named as the division’s best player when he helped Chesterfield to the League Two title last year. You do get the feeling sometimes the Pompey boss would be pulling somersaults at the capture of an irritating blue bottle, such is his infectious exuberance. The noises being made elsewhere underlined he was justified, however. Every time Roberts’ name was brought up there were knowing nods at the quality of the signing. One fellow journalist spoke of his team being torn apart twice by the attacker last season in League One. He was convinced he was bound for the Championship and not a team who finished 16th in the Football League’s basement tier last season. We know we’ve been here before, when it comes to recruits. Two years ago, a huge swathe of arrivals were greeted with endorsements from those who watched them each week. Last summer it was Jed Wallace who was delivering the confident chat about what was ahead, after agreeing to sign in the face of interest from a higher level. He matched the talk – those around him didn’t. The bookies’ odds match those afforded Pompey for the past two seasons, too. It means little. But the optimism from fans is now even outstripping that felt in the past two summers. That can be seen in the impressive flow of fans renewing their season tickets. At the end of last week, sales were around 500 in advance of the same time last year, when a hugely impressive 11,047 were sold. Yes, hope springs eternal once again around Fratton. Maybe, just maybe, there’s just a little more conviction to the optimism this time around.